Games in 2018 continued to astound— it’s just too bad I didn’t play as many as I would have liked. Because that means not only did I miss some great experiences but I’m certain I missed some fantastic soundtracks, too. 2018 saw lots of personal changes for me. There was lots of stress, lots of new territory, and less time for video games. I still managed to play some of the bigger ones, and miss other huge ones. It’s why Marvel’s Spider-Man or Red Dead Redemption 2 won’t be here. 2017’s NieR: Automata is still missing because I just haven’t gotten around to it (maybe I can ask for forgiveness yet again?). As always, with my backlog that keeps on growing as amazing titles keep coming out, I played some things held over from previous years. But I like to give credit where it’s due and if I played it in 2018, and it was great (or interesting), it goes on the list. Such is the case with this one which came out in the summer of 2017, but I didn’t start playing until January. And I never wanted it to end. This tactical game was colourful, fun, and eased me into its increasingly difficult mechanics beautifully. It’s a genre I adore with a passion but often struggle with. That was not the case here, as I did not suffer any real moments of frustration. Its boss fights and cleverness were a blast. Grant Kirkhope, legendary composer and hilarious human being he seems to be, surprised with this track which plays in an end game area. While that one stood out as something extraordinary, the entire soundtrack, like the game, is delightful. If you know me at all, I love spookiness in my games and Mario games have my favorite enemies in Boo. This is why it was so hard for me to see my poor little Boo friends all chained up and oppressed! But I’ll half-forgive it for the music that came from the graveyard scenes, including one of the funniest disses to Mario from the area’s boss. Anyone that insults Mario is the best. If you haven’t heard it, please play this gem of a game! Now I’m wishing this game never ended, all over again. Luckily for me I still have the Donkey Kong DLC to tackle, so there’s that. If ever I needed additional proof that the Metroidvania genre or platformers aren’t really my thing, I could flash my Hollow Knight badge of dishonour. At the time of this writing, the game, which I started playing when it came to Nintendo Switch in 2018, remains unfinished. I’ve spent hours trying to navigate its hallways, and I’m probably over half way through. It’s been a grueling time. Despite the shaming, I kept at it and intend to go back. I couldn’t help but want to keep trying. Its world is dark, creepy, and highly engaging. Braving new areas without a map is the stuff that puts anyone on edge, no matter how cute its main character is (or even some of its enemies!). Battles are fast, new creatures bring so many challenges and unpredictably. Tight spaces with the threat of death from acidic waters, spikes, and ever present enemies, makes for a personal nightmare of mine. I don’t know the lore behind this yet. It’s why I’m willing to go back and finish this excellent one. I just need a break from it for a bit. All summer, which then spilled over into autumn after a hiatus, I played The Swords of Ditto. I was determined to finish it, running through its adorable cartoon aesthetic, to save Ditto from a cycle of destruction. I needed to see how it ended and I won’t spoil it. Beneath its cutesy graphics, and Zelda-esque inspiration in its design, the game is layered with an intriguing sci-fi plot mixed with fantasy and religion. It’s an interesting rogue-like adventure that’s charming and smart. Packaged with its beautiful animation is a playful soundtrack featuring kazoos, sci-fi synth, and just the right amount of mysterious musical undertones for the sort of cheeky, dangerous adventure it is. Here’s something I didn’t do: play the first Ni no Kuni. But I did play the heck out of the sequel. I’m thankful that I got to spend time with my sister playing this one earlier in 2018. She would build our town, and I would handle the battles. I was also at her mercy to clear the coffers and make her money. Because she’s a tough manager, that one. Good memories were had despite the constant managerial reminders over text and twitter. We found a pleasant JRPG, with some unpleasant people, and a sweeping soundtrack that’s so native to fantasy-driven grand scale adventures such as this. While some of the music over-stayed its welcome by being repetitive (the theme from Goldpaw comes to mind), the pieces set the tone to accurately depict the culture portrayed in each area. From the mechanical sounds of a technologically advanced, scif-fi city of Broadleaf to the romantic movements of the lovelorn Hydropolis. They all fit perfectly but one of the most interesting pieces was built around the main theme, and correlated into the building of your own kingdom. From small beginnings to a grand force to be reckoned with, the music of Evan’s kingdom grew along with it. By that I mean, with every level up the Kingdom progressed into—more people, more shops—the main theme became more dynamic. At first, fitting for a tiny settlement with quieter tones, and eventually adding in more instrumentation until the kingdom’s final upgrade with a theme that’s enormous and stately. I spent a lot of time adventuring in games that ate up my time. Dragon Quest XI (a favourite of mine in 2018 and a top three behind Dragon Quest VII and V) was one of them at 140 hours. The other was my first hefty jaunt into multiplayer territory. At around 100 hours, I enjoyed Monster Hunter: World in a way I never thought possible—and I swear there are reasons other than chasing down my poogie after an unfortunate introduction to the giant pot in the game’s canteen. With the help of resident TAY’er Dangerous, who helped me every step of the way, I bluffed my way through the game’s many beautiful, harsh environments, and its tough monster hunting. Monster Hunter: World is really something else: a challenge like no other, fun like no other, and boasting an incredible soundtrack for its very unique monsters and world. I won’t ever forget the stress of fighting the fiery Teostra as its theme pounded a systematic rhythm into my brain (while the tactics of actually besting it sadly did not). Nor will I forget the chasing down the Odogaron, or should I say, it chasing me. I definitely won’t forget my buddy Val Hazaak. His grossness of oozing flesh a sore sight but I couldn’t help but love fighting him if only to hear just how brilliantly fitting his theme is. The themes in Monster Hunter: World, particularly those of the monsters themselves, grow in scale. Each are impressively tied to their environments and the ferocity of their fights, the ebb and flow of others, and the marvelous spectacle they are. It’s true of every one listed, and same can be said of Bazelgeuse, the annoyingly persistent threat of the sky. He shows up to party in the midst of battles to make things that more interesting, as if struggling on a hunt wasn’t enough. His presence dominates a battlefield, with his theme doing same: signaling his appearance like a villain in a cheesy horror movie. It’s great that I learned early on the value of a dung pod, an item I used fondly to get the troublemaker out of my battle. Minit set about challenging my need for exploration, and therefore, my perceptions of games. The game that stripped all of the fluff away, focusing instead on doing on only what’s necessary to solve its clever puzzles through bite-sized adventuring for a minute at a time, scared me. As I wrote back in April, I’m used to the often aimless wandering of JRPGs, or The Legend of Zelda type games. Going at my own pace, enjoying what the off-beaten path may hold. Minit does away with this with a countdown clock that is a pressing reminder to be efficient. Thanks to this, I felt the looming pressure to begin playing, and did all I could to “explore” before triggering the clock—a futile attempt at grasping at my video game safety net. Constant deaths were accompanied by an upbeat bit style soundtrack. It’s actually quite lovely and easy-going, until it’s not. Pleasantries gave way to more frenzied sounds as the time ran out on each minute of play. I was fortunate enough to hear this overture at E3 2016 performed by an orchestra on Sony’s press conference stage. I laughed about it then because it was such an over-the-top presentation, well before knowing what game it was for. It sounded beautiful. But after the reveal, I was underwhelmed by the game’s announcement. God of War was coming back, and I was mostly indifferent. I played the first two main games which were full of gore with Kratos, who isn’t at all a likable character. They were fine for what they were—hack and slash fests that were fun enough but nothing life changing for me. The only thing that had my interest was that I played the games with my Dad, who enjoyed the craziness of it all. The games were a good way to bond, and this new God of War, as the months went by before release, touted a changed Kratos. One trying to handle his rage, regret, and who had a son. After reviews came out and were positive, I decided to take the dive. Dad and I had fun in the time we played, and that’s the experience I valued most. The soundtrack is as bombastic as Kratos and Atreus’ journey, and I’ll pay even closer attention to it when I finally finish the game, but the music signaled quite the spectacle then and it certainly lived up to it. Here’s another 2017 outing that I played in 2018, and I’m glad I didn’t sit on it for too long. The truth of it, however, is that I probably would not have played had it not been for my friend (disclaimer: met him weeks after interviewing him in 2017), El Huervo, who contributed to the soundtrack. The Steamworld Dig series would have flown under my radar, despite its accolades for this sequel back in 2017. I still haven’t actually played any of the other games but I will. Metroidvania-type games are rarely the kind I seek out (see: Hollow Knight). But I gave this a whirl, even though I didn’t play the original, and it was quite good. It was fun tunneling along, planning out routes and ways to destroy enemies (0r getting destroyed). But what was truly surprising, and stayed with me after playing it, was the insane turn the game took at the end. It was scary, and the relatively easy-going adventure with a mystery at its heart, became a sci-fi nightmare. I’ll have more to say about this game in the next few weeks (hopefully). I’m still processing my thoughts on it but I can tell you one thing: The music is phenomenal. There’s a song in particular that involves pizza, and it’s a great representative of the type of quirkiness you can expect to find from this game about hover biking on Mars. That’s not the song I’ll leave here, but this one by Oscar Brittain, the one-man creator of Desert Child, is a fantastic piece that largely makes up the sort of slick style the game goes for. When this came out on Nintendo Switch back in February, I couldn’t stop playing. Then I abandoned it for no other reason than I felt like I achieved a personal goal in overcoming a particularly hard part. I was near the end, too, which makes this excuse even worse. But now that I’ve remembered I committed such a crime, I’ll definitely have to purchase this soundtrack. Because it is damned incredible. 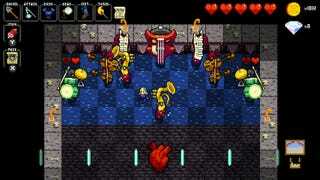 It has diverse musical styles, which are just perfect for the rogue-like rhythm game that is. There are reggae-inspired beats, metal riffs, European dance tracks, ridiculously unexpected opera pieces—it’s got just about everything, and it’s never dull. Oh, I guess I can try to play the game again, too. Maybe. That’s (mostly) my 2018 for you, and all the great things I listened to in the world of video games. Follow Narelle Ho Sang on Twitter @Zarnyx if you’re feeling adventurous, or you can read her articles here.